These easy to use wipes clean and shine instantly leaving a high gloss and protected finish. 12 Individually packaged pre-moistened towels with a clear formula to be used on any color leather. 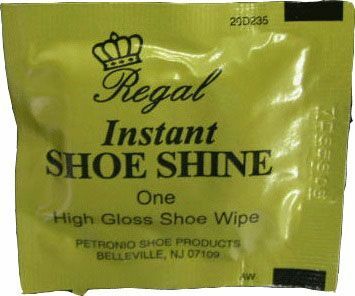 An instant cleaning and shoe shine in a flash. The individual packets can easily be stored in your desk, suitcase, golf bag or automobile. When you want to give a good impression these will help you shine!